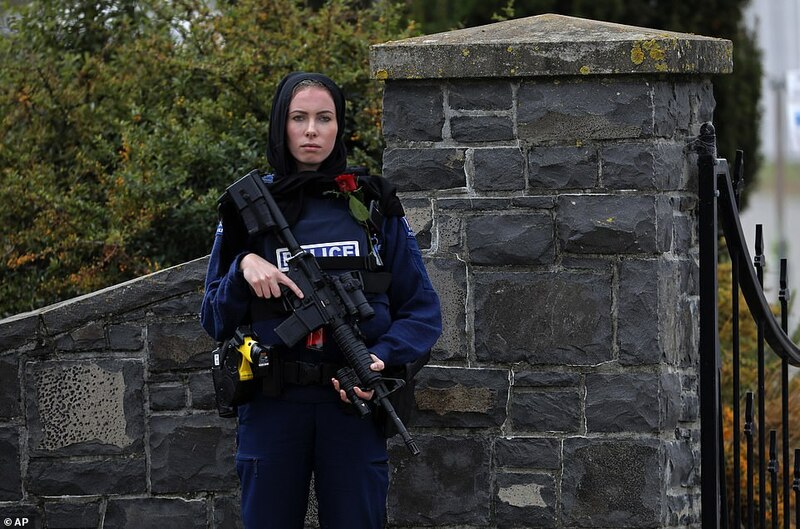 Toting a semi-automatic rifle, police officer Michelle Evans looked foreboding as she stood outside a cemetery in Christchurch on Thursday. But her decision to wear a hijab and pin a red rose to her bulletproof vest as an act of symbolic solidarity touched people around the world. 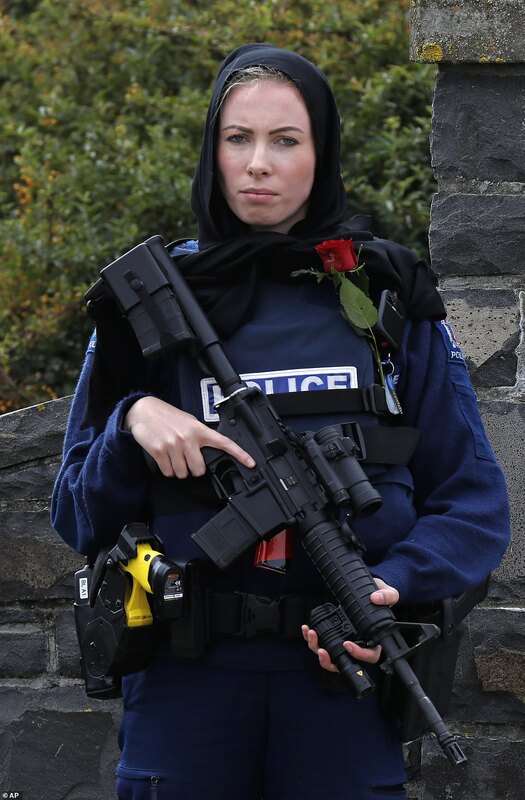 The photograph, taken by Associated Press photographer Vincent Yu, went viral on Friday with many people commenting that Ms Evans perfectly reflected the feeling many New Zealanders had towards Muslims. Constable Evans is just 24 and joined the police force in 2016 as a new recruit. 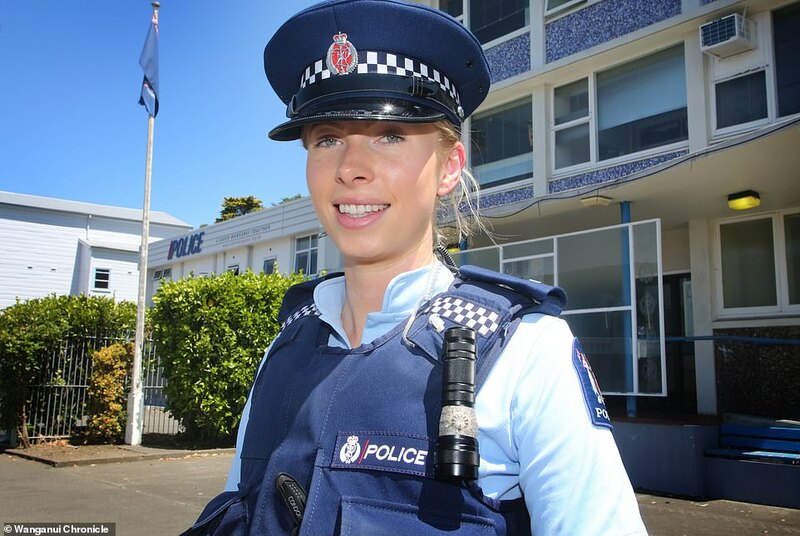 In an interview she gave to The Whanganui Chronicle, Ms Evans said she wanted to become a police officer to serve the Whanganui community, where she was brought up. 'I want my career to be here. I love Whanganui. It's a beautiful, small town and this is where I want to live,' she said. Ms Evans shared a post about the pressure of being a police officer six months ago. 'It’s not normal, to carry the burdens police officers do, emotionally, physically, and mentally,' the post said. Constable Evans began policing after spending her gap year studying business and accounting. When she began working at Whanganui Police she wanted to focus on youth engagement and frontline work. She works out everyday, likes to paint scenery and reads about health and psychology because she is interested in how people think. On Friday Ms Evan's colleague took off his cap to show respect for grieving family and friends attending funerals. While New Zealand bikie gang Mongrel Mob stood guard outside Friday prayers in Jamia Masjid mosque in Hamilton, in the North Island. Hundreds of Muslims and non-Muslims gathered in the city's Hagley Park opposite the Al Noor mosque where worshipers were gunned down in a horrific terror attack just over a week ago. New Zealand Prime Minister Jacinda Ardern wore a black and gold headscarf for the emotional engagement. 'New Zealand mourns with you, we are one,' she said. The call to prayer was heard at 1.30pm local time (11.30am AEDT) and followed by two minutes of silence.